Effective use of HIT can help meet some of the challenges of transitioning patients from one care setting to another. Over the past several decades, technology has become an increasing presence in nearly every aspect of society. It has changed how companies work, how individuals connect, and, of course, how patients receive and monitor their health care. Health information technology (HIT), such as electronic medical records (EMRs), allows, for instance, patients to schedule appointments online and check test results; it allows providers to input, update, and review information; and it draws a line between patients, providers, and additional or new providers. This connection is particularly important considering how health care has also changed over the past several decades. For example, when Cheri Lattimer, RN, BSN, executive director of the National Transitions of Care Coalition (NTOCC), began her nursing career, the health care system was considerably more consolidated. "I started in the [emergency department] after I graduated, and then I went to work for a general practice," she describes. "When I went to work for them in 1969, they were surgeons, they delivered babies, we ran all of the lab work and EKGs and were able to do simple X-rays. Everything was done right there [in the office]." Today, the system is often described as a series of silos, with patients seeing specialists who may or may not effectively communicate with each other and the patient's primary care physician. Such separation creates challenges, particularly when patients are faced with transitioning care—moving from one health care setting to another and/or to home. This is where the increased use of technology can start to play a role. When HIT is effectively used in these situations, the transition often runs more smoothly, creating open lines of communication, granting the opportunity for all team members to access and relay data, and making the patient a valued and active participant in their health. Social Work Today speaks with several professionals for a better understanding of just how HIT impacts transitions of care. To best understand the impact, one must first understand exactly what HIT and transition of care mean. Generally speaking, HIT is an integral part of many health care systems, used to provide better access, accuracy, and outcomes. "HIT helps provide a foundation for patient-centered care, quality improvement, and cost-effective care," says Pat Stricker, RN, MEd, senior vice president of clinical services for TCS Healthcare Technologies. "It provides a framework to develop and monitor standards for care and performance measures; provide workflow automation and efficiency in productivity; improve communication and care coordination by providing an up-to-date, real-time patient record to all team members 24/7 regardless of where they are located; eliminate or reduce errors and duplication of services; [and] eliminate or reduce labor-intensive paper-based records and chart management." She adds that it can also be used effectively in billing, tracking outcomes, and improving program operations. Examples of HIT include but are not limited to EMRs, patient portals, ePrescribing, and apps that help patients keep track of medications, appointments, and other aspects of their care. Transition of care occurs when a patient's care moves from one health care provider or setting to another. Perhaps the most commonly thought of transition is from a hospital or acute setting to a lesser level, such as home where a primary care physician and/or specialists may take over the monitoring of a condition or illness. Additional transitions include, among others, movement into a long term health care facility, transitioning to home health services, and switching from pediatric to adult care. When these transitions occur, it is the responsibility of the entire team to ensure that all necessary information is given to the patient and, if possible, the next provider. Doing so lessens the likelihood of readmissions and increases the likelihood of ongoing patient health and improvement. But it is not an easy task. "Health care is very complex in lots of different ways, and people are complex, and what you can do for people in terms of health care is complex and only getting more complex," says Eva Powell, MSW, senior manager of quality programs for the Alliance of Community Health Plans. "There's a lot to coordinate. If it's not well coordinated, then the odds of things going well and right are not great." When HIT and transition of care combine, the first and most obvious improvement is in the communication between all involved. HIT can be used to bridge the silos that exist across the systems. With tools, such as EMRs, information can be input by one provider and accessed by another without relying on the patient, caregiver, or outdated technology to deliver all necessary information. "Using EMRs to facilitate communication between hospitals, outpatient providers, community-based organizations (CBOs) and other nonhospital agencies that support patients is especially helpful," says Elizabeth Cummings, MSW, LCSW, manager of transitional care at Rush University Medical Center within the department of social work and community health. "Health partners must be open to partnering and data sharing with CBOs, but it benefits patients by allowing CBOs to tailor services based on patients' medical needs and care plans, and to communicate relevant findings back to the health care team. "This improves health care quality, effectiveness, and efficiency, all while strengthening relationships between providers across organizations with better communication," she says. At Nemours/Alfred I. duPont Hospital for Children, the transition of care team, which includes a social work coordinator and physician, employs Epic, an electronic health record. The system includes Care Everywhere, which allows the exchange of information between providers. This is an invaluable tool. Transitions are rarely a clean cut from one provider to the next. Particularly when transitioning young adults from pediatric to adult services, there may be a time in which both systems are serving the individual. Thus, a program like Care Everywhere eases the move. "We are so incredibly lucky in that we have Epic," says Cory Ellen Nourie, MSS, MLSP, patient transition social work coordinator at Nemours. "We have a lot of patients who go the University of Pennsylvania," she continues by way of example. "[University of Pennsylvania doctors] can log into the patient's chart, and we can also see what happened to the patient as an adult. We can, in a clinical appointment, go through the patient's Care Everywhere chart and add them into the loop." She adds that Epic also creates a space where providers can access the information they need as opposed to all of the information. "From a communication standpoint, it is amazing. There may be 16 pages of relevant information that those providers would need to know," she says. "It is better than requesting every record. No provider is going to go through 14 crates [of records]." Beyond medical records, HIT can improve communication by connecting providers and patients with resources in the community. "I think of our comprehensive online resource database, NowPow, where their organization helps in creating and strengthening partnerships with community providers to allow for closed-loop referrals within our institution," Cummings says. "Through these strengthened partnerships, we are able to confidently refer our patients to community partners knowing that the appropriate resources and services are there for them to access when needed." Beyond the exchange of and access to medical records, HIT allows for what Powell calls equity among all members of the health care team. "There's a pecking order," she says. "While the best teams work well together and figure out a way to manage that, humans are humans. Teams are thrown together that don't work well together and don't communicate well." HIT gives each team member the opportunity to offer the information needed for a successful transition of care without jockeying for a voice. In addition to creating equity, HIT creates and spreads out accountability. When the responsibility of preparing for a transition falls to just one person or portion of the team, information can be lost or forgotten. With the use of the right technology, the responsibility falls on everyone for their individual input. "HIT systems can provide automated tasks and reminders to each team member, so that nothing falls through the cracks; provide care plans; and monitor the progress and status of the care transition using specialized reports," Stricker says. HIT also allows for the most important team member—the patient—to have an active role in their transition. Take, for example, medication reconciliation. "Medication reconciliation entails creating an accurate list of all of the medications a patient is taking, including medication names, dosages or strengths, frequencies of use, and routes of administration, then evaluating the need to continue these medications at the time of a hospital admission, transfer, or discharge," says Mary Barna Bridgeman, PharmD, BCPS, CGP, FASCP, a clinical associate professor at the Ernest Mario School of Pharmacy at Rutgers University and internal medicine clinical pharmacist at Robert Wood Johnson University Hospital. "Ultimately," she says, "the goal of effective medication reconciliation is to resolve discrepancies and ensure the patient receives the correct medications at all levels of care within the health care setting." When patients are able to create and access or hold onto a list of their medications, they can feel confident in the information they offer to their primary care physician, pharmacist, and caregiver. The list can take multiple forms, as well. At Nemours, patients are given a wallet card with their medications listed on it. "We make sure that everything is listed, by the right route and the right dosage," Nourie says. "It's a basic but very important function. Forty percent of my patients don't use words to communicate. In an emergency, we want them to be empowered by [having] that information." Alternately, the patient could employ an app where they keep the same information Nourie described. "Almost everyone has a smartphone," Lattimer says. "NTOCC, in its resource center, has a medication app that patients can share with their pharmacist, their doctors, and their family members. There are a ton of [apps] out there." Lattimer personally keeps track of her mother's medications. At appointments, she's able to hand the receptionist her mother's list of medications and feel confident that the appropriate information is being communicated. Of course, while HIT fills many gaps, it does not cover them all and can create its own challenges in coordinating transitions of care. For one, providers don't all use the same system, and external communication between systems is unlikely. Nourie notes that when they encounter a provider who does not employ Epic, the transition team faxes records, reverting to older technology and paper-to-paper communication. Additionally, access to health records does not always mean that the provider will make use of the information available. Lattimer references times in which she and her husband show up for an appointment and the specialist or primary care physician does not have the necessary information, despite it being sent. Lattimer has had to ask more than once, "Did you go into the scan folder?" "Physicians don't communicate well with other physicians," she says. "How many times does the primary care physician refer to a specialist, and the specialist doesn't have any records or the primary care physician doesn't have any records? "If we can't figure out how to communicate with each other—if we are not committed to bilateral communication—technology is not going to do that for us," Lattimer says. Technology also does not ensure that patients understand what is communicated to them. Yes, they have increased access to their health information, but can they decipher it? "When it comes to our patients and family caregivers, we tend to use our medical language and think it's done," Lattimer says. "We want patients and caregivers to be engaged, to ask questions of the team. But when we give them written material, did we give them informed health literacy or was it in the last five minutes as they walked out the door?" Additional challenges center around security and the ability to share information. For example, providing patients with their medical records on a USB drive can seem like an efficient way to transmit information from provider to patient to provider. However, most hospitals and health care facilities will not plug an unknown USB drive into their system. The risk of virus or malware transmission is too great, as is the risk of losing the drive—a loss that can impact the security and privacy of the patient. Thus, this method often leaves a wealth of information untapped in the patient's pocket. With all of these tools and technology in use (and not in use), where does that leave the social worker? A key member of the health care team in all settings, social workers remain critical in facilitating effective transitions of care. Those like Nourie are deeply involved in the transition planning. She covers with her patients everything that falls under "#adulting," she says. "I talk about what they do the 360 days a year that they're not seeing the doctor." Nourie is also actively involved in using Epic and ensuring that the appropriate information is in the system, the patient understands the information they need to understand, and the transition plan is updated as needed. While many social workers may not have the same prominent role in transition planning, they remain a key source of listening and relaying on the team. "Our social workers are the connection between inpatient and outpatient settings and can reinforce the care plan from both sides," Cummings says. "Regardless of whether our patient discharges into the community or readmits to our hospital after a few weeks, we are in the unique position to relay all necessary information to the receiving entity of the status of one's care plan." Powell agrees, noting that the greatest strength social workers bring to the table is the fact that they are social workers. 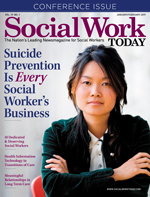 "Social workers are trained approaching problems with a systems perspective. That's really what it's all about," she notes. At the end of the day, HIT is a tool that can be used to improve transitions of care. But tools need users, like social workers, who can see the individual and the big picture and bring them together.